NSW Shade & Sails only use fabrics of the highest quality that is made to last. Many companies use inferior, cheaper products that do not offer the longevity that NSW Shade & Sails can offer. Rainbow Shade Z16 fabric has been tried and tested throughout Australia, New Zealand and many other countries over the past 18 years in projects large and small. Recommended by Engineers and Architects, the unique knitted shade fabric is the first choice of major shade sail and shade structure manufacturers for use in: Tension Structures, Shade Sails, architectual design structures, building awnings, gazebos, giant umbrella’s and more! Comshade is a unique and innovative commercial, heavy duty knitted shade cloth designed for large tension membrane shade structures, where the shade cloth fabric is placed under greater loading strains. Its strength to weight ratio makes Comshade, ideal for larger commercial shade structure projects, where the shadecloth fabric is exposed to the harsh environmental conditions of wind, rain, hail, dust and UV exposure. The unique heavy duty knitted construction of the shadecloth offers maximum Ultra Violet A & B protection with very high Ultra Violet Protection Factors. Comshade shadecloth is available in fourteen popular colours, and comes with a 10 year UV warranty. 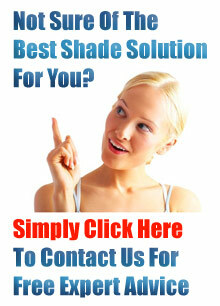 Designed for maximum UV shade protection, Comshade adds value and appearance to any project, building or structure. Monotec 370 Series shadecloth is a heavy duty commercial grade knitted shadecloth. It is equally suited to all shade applications from domestic to the largest commercial and architectural projects. Monotec 370 Series shadecloth is manufactured using only the highest quality UV stabilised HDPE. The Extrablock range of knitted shadenetting fabrics has been specifically designed for use in tension structures, but performs equally as well when used on standard carport structures, awnings and even umbrellas. Extrablock offers….